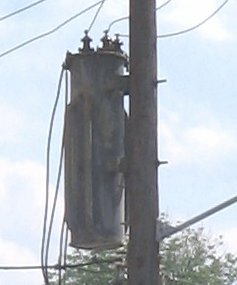 This is an old transformer I saw in Marion NC. I have never seen one as skinny as this. Looks like a 3 phase transformer, likely inside the first phase's core is at top, then in the middle the 2nd phase's core, and at the bottom the 3rd phase's core. I see 3 insulated primary feeds, so it may be a delta primary and likely a Y secondary. I once lived in an apartment complex fed by such a transformer, and each apt had 120/208V, 2 of the 3 phases. I did see few like that in my area in Wisconsin however in France it is pretty common with older one and they are typically 15 or 25 KW size and I did see one not far from me someday I should take a photo that is single can with triphase system in there that one is 50 KW size. Looks like there are four secondary conductors leading away from it. If the cores are stacked (which sounds like the only plausible arrangement), they must be pretty small capacity. Greg, do you remember what this transformer supplied power to? I'm not too sure I have ever seen a poly-phase pole transformer before...seen lots of pad-mounted ones. Great find, too. Older equipment finds like this are fascinating...the older, the better. It was in the commercial/retail area of a small town in the mountains. I am not sure what was in the building it served. An older house with the original 3 phase air conditioning system from the 1950's? In Oradell NJ (PSE&G)(my home town) there's an old development with several houses fed with open delta service. For central air. 120/240 and 208 wild leg. Yep, my first apartment was in Emerson, NJ and we had one of those bad boys feeding our cluster of buildings. My building had been converted to eliminate the wild leg and was strictly single-phase. I never understood the need for the wild leg since none of these buildings even had central A/C or any large loads for that matter. Everything was "hotel-type" through the wall heat pump units. The only thing that I could figure is that since we were located next-door to a shopping center, perhaps PSE&G just equipped the whole area the same way, whether needed or not. The places were built in the 1960's, back when cost was not object.